A couple of weeks ago I was invited to a local university to give a talk on Google ranking factors. After the session ends one of the lecturers asked me is there’s a way to do SEO to rank his app high on the app store. Honestly I have never given it a thought at that time. I didn’t know what to answer him but I promised to look into it. And so I did. In this article I’ll talk about what ASO basically is, why is it worth looking into and the key areas of optimization. As I did my research I find out that there’s already a term for it – App Store Optimization or in short, ASO. But the thing is, it’s a relatively new field with scarce information. But that makes it much much more interesting to explore! So what is ASO anyways? Kissmetrics defined ASO as “the process of optimizing mobile apps to rank higher in an app store’s search results.” while MOZ explains ASO as “a way of ensuring your app meets app store ranking criteria and rises to the top of a search results page.”. While both of these are technically correct, in my opinion, the definition can be A LOT better. You see, we are doing the same mistake with SEO in the beginning. 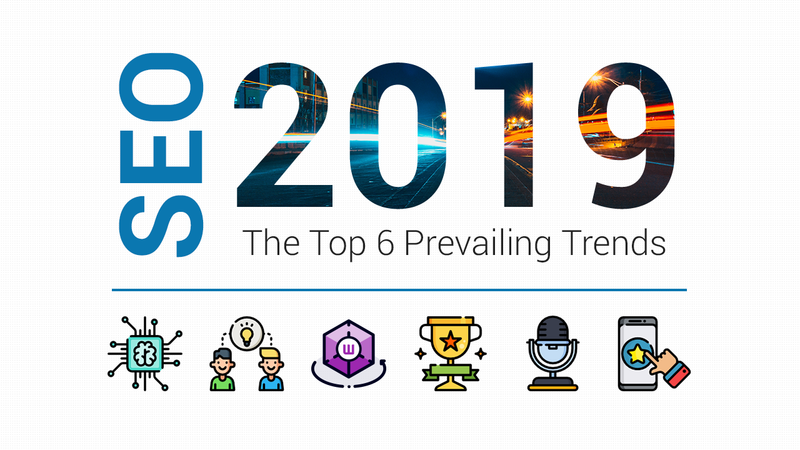 While initially SEO does only revolve around ranking your website on search engines, over the years it has evolved to this whole new marketing tactic that encompasses a lot more practices with the end goal of getting organic traffic into your website. Sophistication in search engines lead us to not only consider the direct and technical factors of influencing the ranking, but also indirect factors such as creating truly engaging contents, content promotion through social media and even building relationship with influencer and communities. The same can be said for ASO. Rather than just ranking your app high on the app store search bar, ASO aims to to maximize the discoverability and the number of downloads your app gets. Which begs another question – how important is doing ASO. Should we care about it? To answer this question we need to take a look deeper into the app market. It is no longer a speculation that the world is moving towards the mobile era. Search engine giants like Google notices the rising trend of mobile searches and started to make their search results mobile-friendly. A slew of companies rises up from the mobile app market, from being unknown to become a household name in a matter of months. Apps like Uber, Instagram, Tinder, Snapchat and Waze revolutionize our lives while others like Spotify, YouTube or even mobile games like Candy Crush, Clash of Clans and Angry Birds give us a whole new ways to entertain ourselves. But the real question is how much money is all of these worth? In 2015 alone the app industry is worth 41 billion dollars. 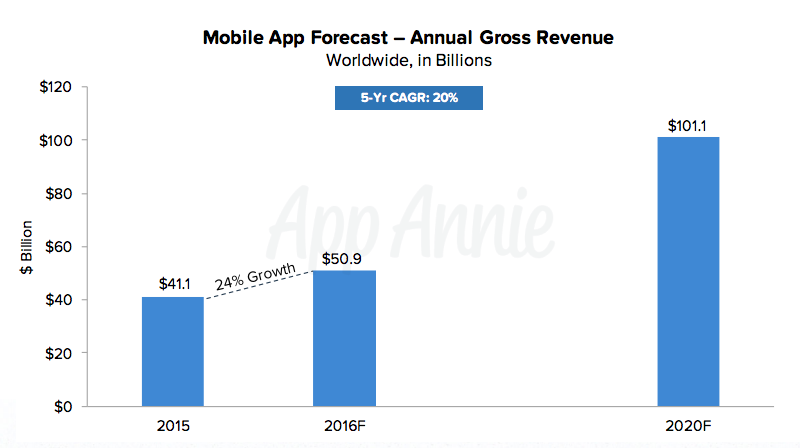 App Annie predicts that it will grow 24% and worth 50 billion in 2016. The app market is worth 41 billion dollars in 2015 and is predicted to worth 101 billion dollars by 2020. The figure is forecasted to double up by 2020, making the app industry worth up to 100 billion dollars. That’s a huge chunk of pie. An increasingly high number of website owners have also started converting their websites into mobile apps. This so called “mobilization” can be very useful especially if your target audiences come from the younger generation. We already know that mobile usage already trumps desktops. 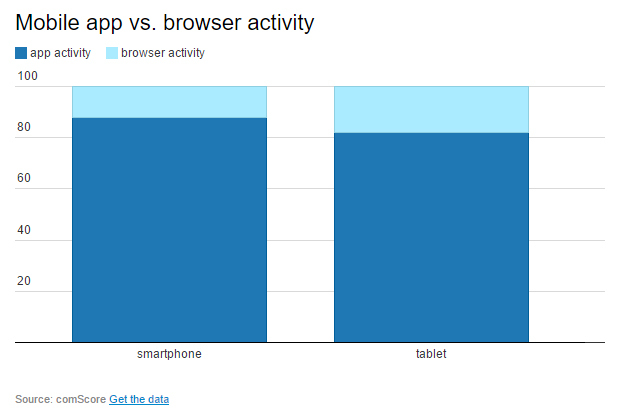 Another point that favors mobilization is that app usage on mobile devices dwarves web browsing. App usage trumps web browsing in mobile devices. It’s not too far off to say that one day, app might replace browsing websites altogether. Especially with major websites such as Wikipedia, Facebook and Quora have long gone mobile. So even if you don’t currently deal with apps at the moment, it’s still something worth knowing as it might be where the future is heading. So one of my first thoughts when thinking about ASO is, what is actually there to be optimized? Unlike a full-fledged website, there’s not much to be included in the app page and hence, not much room for optimization. But as I look deeper into the subject, I realize that I couldn’t be more wrong. You see, while ASO is still a new field, there are quite a considerable amount of things to be done that can contribute to getting more views and downloads on your app. The App Page can be considered as ASO’s on-page optimization equivalent to SEO. It’s the only area where you have a total control of for optimization. App Title – There are some who advocate to include your target keyword in your app title. 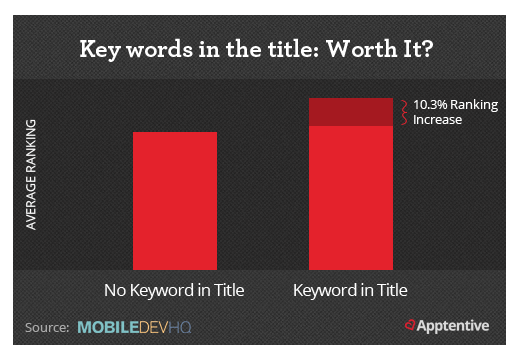 Research shows that including your keyword in your app title can increase your search ranking by 10%. 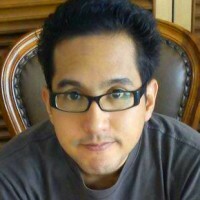 App Icon – While I believe is not a direct ranking factor, a unique app design can increase click-through-rate allowing more downloads, indirectly improving ranking. Header Design – Similar to your icon, a good header design can indirectly improve ranking. In Google Play you can even include a video as the header. App Description – One of the key pointer to be remembered is to use your target keywords sufficiently (around 5 times) in Google Play. The first 160 characters of the description also doubles as the meta description for web search. Descriptions are not searchable in App Store but what you can do is to include as much information as possible in the first 2 lines. This is because only the first 2 lines are visible without the need to tap the “More” button. Screenshot – Optimizing your app screenshot includes making them interesting as well as helpful. Labeling and describing parts of the app in the screenshot for example is a good practice. If the App Page is the on-page aspect of ASO, the User Feedback can be considered as the off-page portion. Getting good rating and review will surely boost your app ranking. Request users to rate your app but do it sparingly to avoid annoying them. Improve availability and accessibility to technical support so that users don’t write complaints in the review. Ankit Jain from Google Play reveals factors that affect mobile app discoverability. 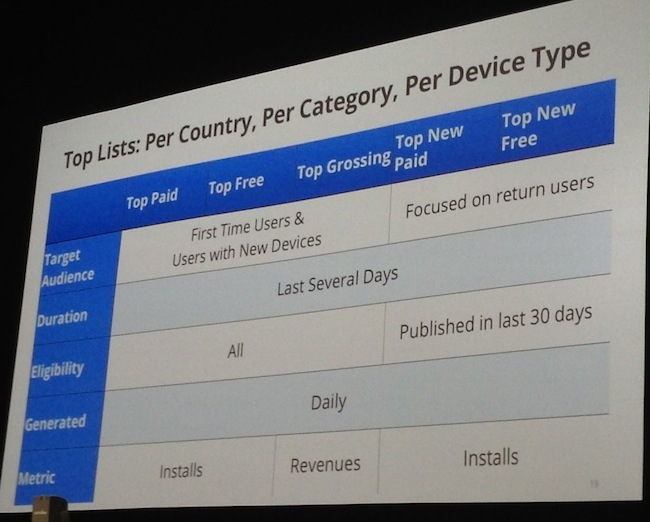 Both App Store and Google Play tracks overall stats of apps and use it to influence the ranking. Number of installs – The amount of people installing your app can be considered as important as how backlinks are to websites in SEO. It’s both your end goal as well as important metric to increase ranking to get more installs. Number of uninstalls – User retention is another important metric and it is measured in number of uninstalls. So it’s not just important to get users to install your app, but also keeping them in. Number of long installs – This can be seen as a measure to avoid manipulation as app owners might be able to build false installs to boost up the stats. An installation that lasts for several days might be what is considered as long installs. Revenues – How much money your app make might also contribute to better ranking. It is at least confirmed to affect your app placing in the “Top Grossing” category of Google Play. Usage frequency – Another measure to avoid manipulation is by tracking an app’s user activity. The more frequent it is used, the better it might rank. Application package size – While not exactly a tracked stat, Ankit Jain from Google Play mentioned that smaller installation package tends to get installed more. This makes sense as there are two related concerns. One, bigger files takes longer to be downloaded. Two, it will consume more mobile data – a genuine concern especially for users with a limited data package. So as you can see, ASO is not that much different from SEO. Just by glancing at the basics we can already see a lot of items that each can be expanded for best optimization practices. Title optimization, description optimization, reputation building and installation optimization might soon be big titles on their own as the mobile and app market grows bigger and more sophisticated. Technology can change overnight. While for now, websites still maintains a stable stronghold, who knows how long it will last. 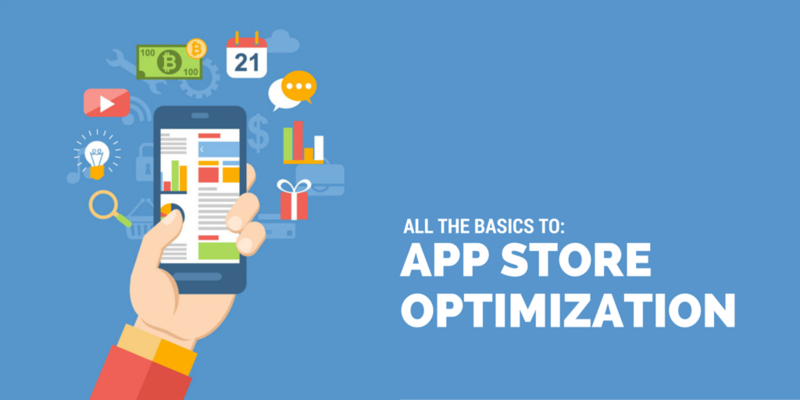 By understanding the basics of ASO, we can start planning on how to take advantage of the booming app market and run it concurrently with our SEO strategy. This topic is a bit far off from our normal focus but if you like to know more, let me know in the comments and I’ll continue to expand more on the subject.